The Contemporary Art + Design Wing is the largest space dedicated to contemporary glass anywhere in the world. The galleries will feature more than 70 works from the Museum’s permanent collection, including recent acquisitions and large-scale works that have never before been on view due to space restriction in the current contemporary glass gallery. 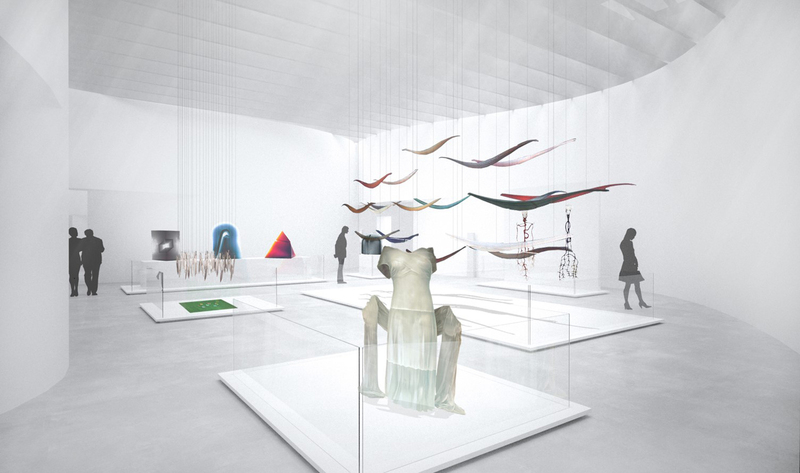 Rendering of Body and Narrative Gallery. It was a tall order, determining how to showcase the past 25 years in glass. Artists began working on a larger scale than ever before, incorporating new materials and mixed media into their designs. How to organize the works? What stories should the galleries tell? * Works on view for the first time. Visitors approach the new galleries through the Promenade that presents the idea of glass as a material for contemporary art with large-scale works. Choreographed Geometry (2007) by Klaus Moje is a four-panel painting composed of more than 22,000 hand-cut strips of glass that have been heat-fused together. The Portland Panels: Choreographed Geometry, Klaus Moje, Portland, OR, 2007. A gift in part of David Kaplan and Glenn Ostergaard and purchased in part with funds from James P. Flaws and Marcia D. Weber. Photo: Ryan Watson, courtesy Bullseye Gallery, Portland. L.1.4.2014. 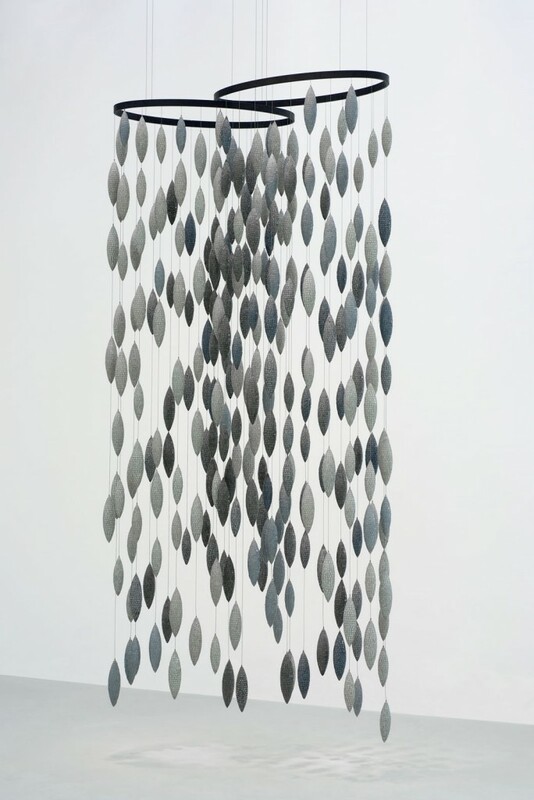 Fog (2007) by Ann Gardner is a suspended sculpture in which hanging mosaic-covered pods in grays and whites imitate the atmospheric condition of clouds that are opaque one moment and translucent the next. Fog, Ann Gardner, Seattle, WA, 2007. 2012.4.53. 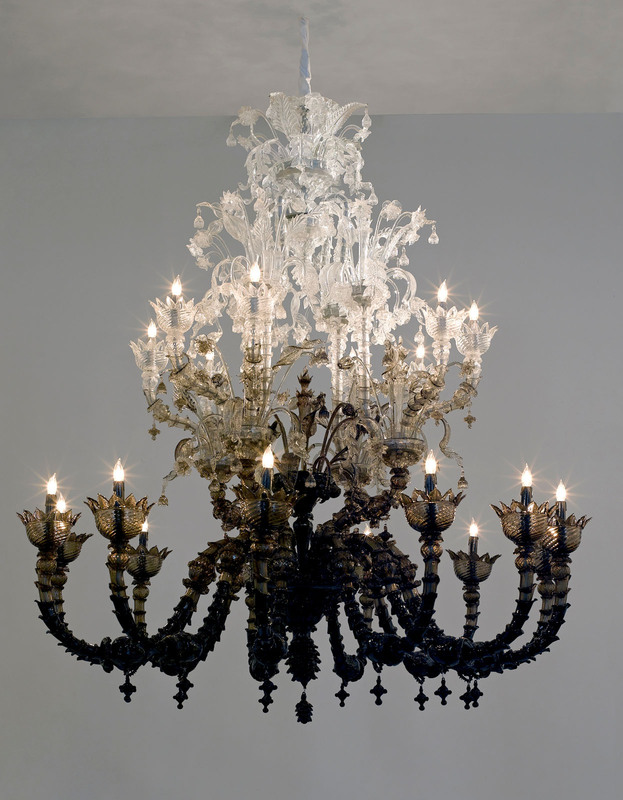 *To Die Upon a Kiss (2011) by Fred Wilson draws its name from the dying words of Shakespeare’s Othello, and is inspired by the highly decorative chandeliers that adorn the palazzos lining Venice’s Grand Canal. In this work, Wilson refers to the enduring, but rarely discusses, African population in Venice. 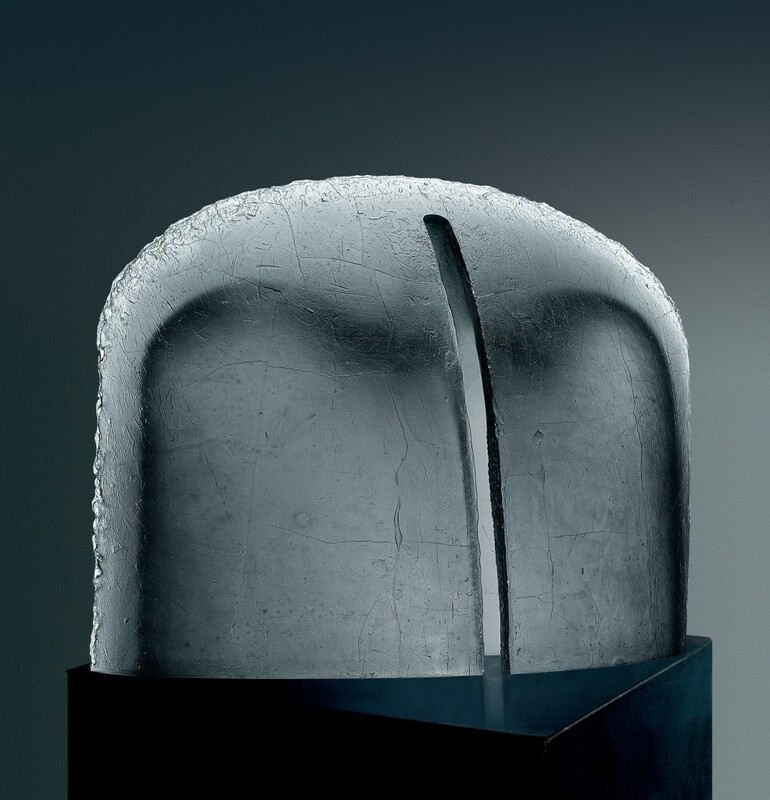 The color of the sculpture gradually shifts from opaque black at the bottom to colorless glass at the top, depicting the slow ebb of life. To Die Upon a Kiss, Fred Wilson, Murano, Italy, 2011. Image courtesy of Pace Gallery. 2014.3.10. The Nature Gallery is dedicated to sculptures that refer to the natural world. 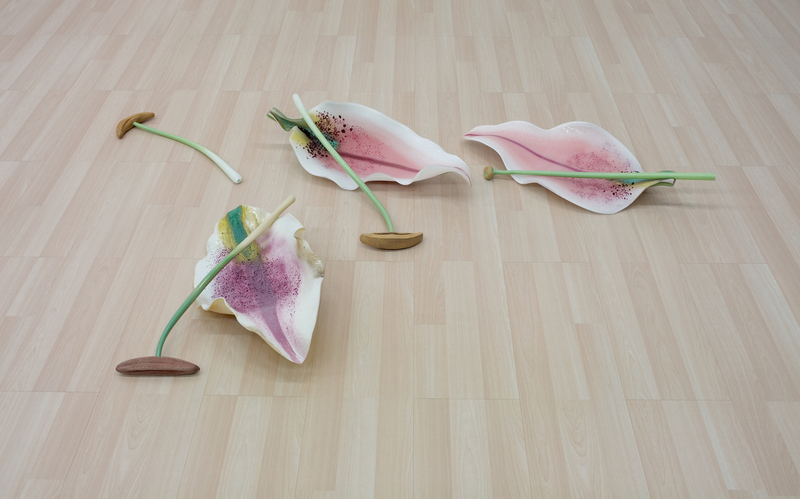 On Extreme Fragility (2003) by Anne and Patrick Poirier is inspired by the famous glass flowers made for Harvard University by the 19th-century Bohemian glassmakers Leopold and Rudolf Blaschka. On Extreme Fragility (Homage to Blaschka), Anne Poirier and Patrick Poirier, Venice, Italy, 2003, 2008.3.78. 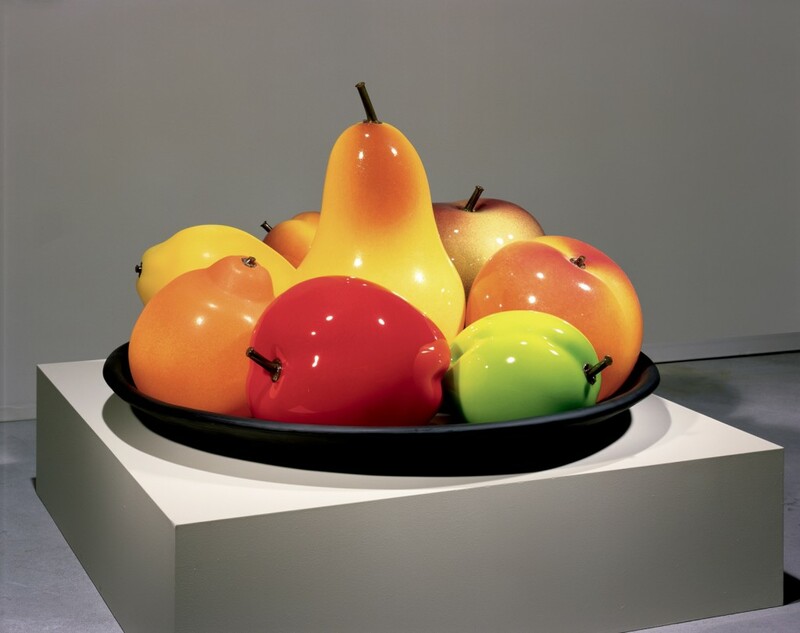 Still Life with Two Plums (2000) by Flora Mace and Joey Kirkpatrick is a giant bowl of glass fruit meant to heighten our awareness of the world around us, including our dependence on nature and its cycles and seasons. Still Life with Two Plums, Flora Mace and Joey Kirkpatrick, Seattle, WA, 2000. Gift in part of the artists. 2002.4.2. 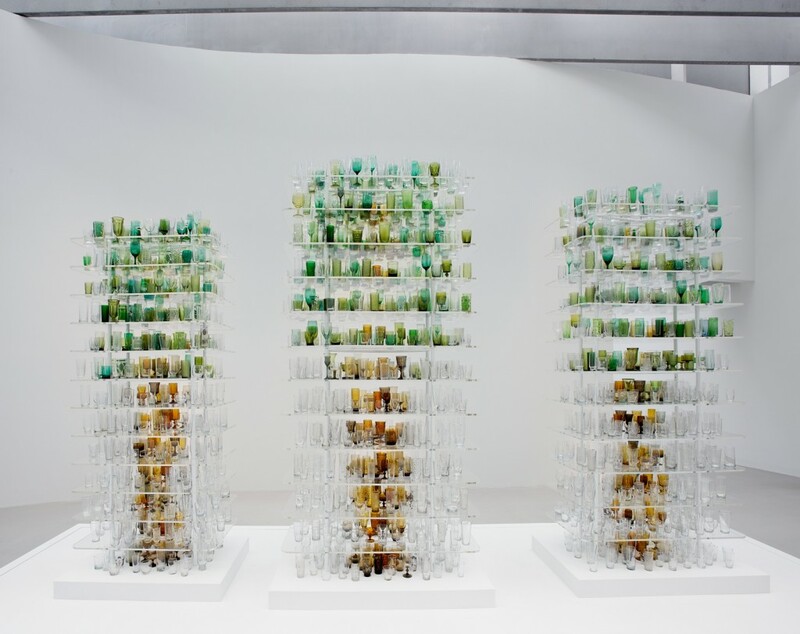 Forest Glass (2009) by Katherine Gray is an installation of thousands of reclaimed green, colorless, and brown drinking glasses arranged on shelves to suggest a stand of three trees. Inspired by the process of creating glass, which historically required the burning of timber to power the furnaces, Gray questions the impact of glassmaking on the environment in the past and present. 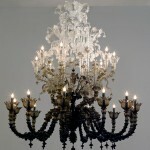 Forest Glass, Katherine Gray, Los Angeles, CA, 2009. 2010.4.49. The Body and Narrative Gallery focuses on works inspired by the human body. Imprint of an Angel II (1999) by Stanislav Libenský and Jaroslava Brychtová is an abstract shape based on a man’s shoulders and chest, its mysterious interior space representing the inner light, or the divine part of man. Imprint of an Angel II, Stanislav Libensky and Jaraslava Brychtova, Zelezny Brod, Czech Republic, 1999, Purchased with funds from James R. and Maisie Houghton, The Carbetz Foundation Inc., James B. Flaws and Marcia D. Weber, the Ben W. Heineman Sr. Family, Joseph A. Miller and Rachel C. Wood, Peter and Cathy Volanakis, Wendell P. Weeks and Kim Frock, and Alan and Nancy Cameros. 2004.3.10. 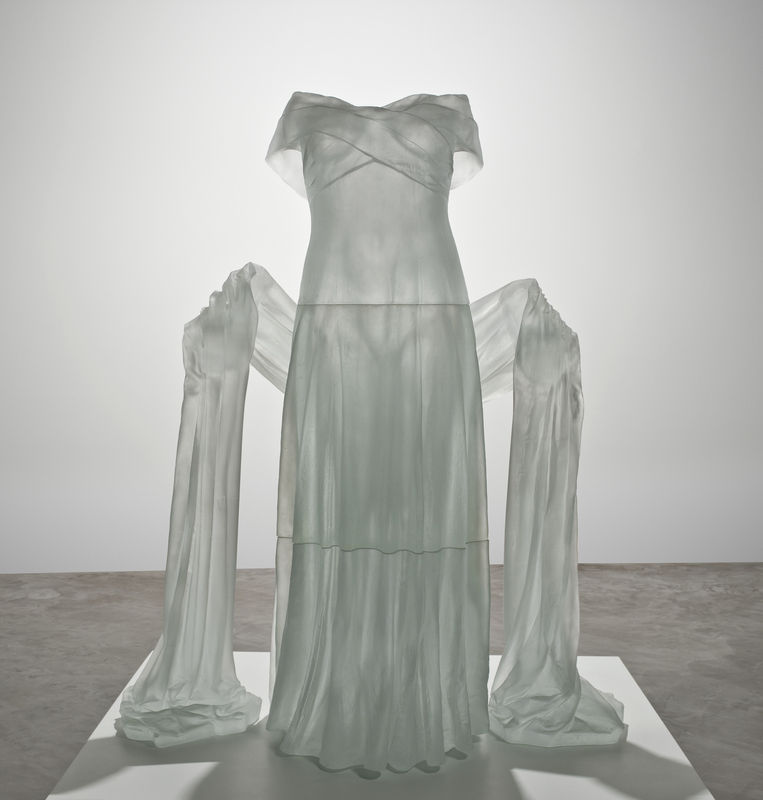 Evening Dress with Shawl (2004) by Karen LaMonte is a haunting evocation of the beauty of classical statuary. Evening Dress with Shawl, Karen LaMonte, Zelezny Brod, Czech Republic, 2004. Gift in part of the Ennion Society. 2005.3.21. 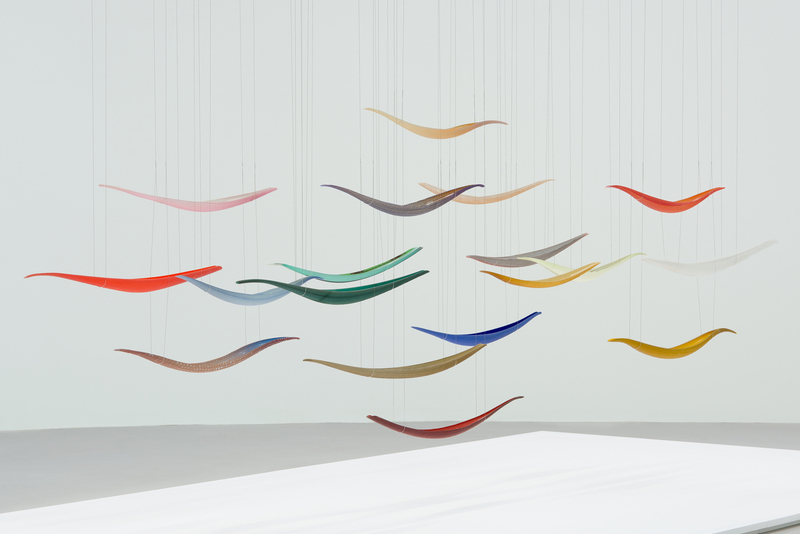 Endeavor (2004) by Lino Tagliapietra features abstract forms inspired by the boats that gather in the Venetian lagoon for the annual Festa della Sensa. Endeavor, Lino Tagliapietra, Seattle, WA, 2004. Purchased in honor of James R. Houghton with funds from Corning Inc. and gifts from the Ennion Society, the Carbetz Foundation Inc., James B. Flaws and Marcia D. Weber, Maisie Houghton, Polly and John Guth, Mr. and Mrs. Carl H. Pforzheimer III, Wendell P. Weeks and Kim Frock, Alan and Nancy Cameros, the Honorable and Mrs. Amory Houghton Jr., E. Marie McKee and Robert Cole Jr., Robert and Elizabeth Turissini, Peter and Cathy Volanakis, and Lino Tagliapietra and the Heller Gallery, New York. 2005.4.170. Check out more works from other galleries in tomorrow’s post. Another piece I like better in the new gallery.